PSA here, feed your queens! Yes they can generally survive without food if fully-claustral. Of course they don't need as much as semi-claustral, and I generally don't feed the fully-claustral protein (as they should have it in their wing reserves). Feeding a queen honey SIGNIFICANTLY reduces the chance they will eat their eggs. I generally just feed them honey, once every 2-4 weeks. This makes sure they are full so they have no need to eat their eggs to conserve the energy. Why eat them to conserve the energy (in case they need to run) when they are already completely full with food!! I bug my queens all the time, like multiple times a day (I'm obsessed! ). All but 1 (so 6 out of 7) has laid eggs, and no eggs have been eaten from what I have seen. They love to eat. After hibernation they would eat the honey right off the toothpick before I could put it on the side of the test tube. I cant say all ants will behave this way, but give it a shot. Just a drop of honey, it could increase the chance of a successful colony!! Here is a picture of Queen feeding day (honey) yesterday! They devoured it! Good luck with your queen feeding! FYI. The one that hasn't laid an egg, refuses to eat and she looks skinny (not in this picture). Behaves differently than the camponotus ants I have had before, not sure what is wrong with her. Plan to try the tried and true method of locking her in a drawer for a month and see what happens. Could be that the ant is not fertile, seems strange that she would be have so differently than the others of the same species. All but 1 (so 6 out of 7) has laid eggs, and no eggs have been eaten from what I have seen. They love to eat. After hibernation they would eat the honey right off the toothpick before I could put it on the side of the test tube. I cant say all ants will behave this way, but give it a shot. Just a drop of honey, it could increase the chance of a successful colony!! If you are going to feed your queens, I would do it on a tray of some sort. The residue left behind can be unsanitary. Definitely a thought, however with the small drops I put it the queen clean it up great. Any residue doesn't seem to mold as it is honey. Update, all of the queens have tons of workers now. So far feeding fertile queens has 100% success rate! Caught 2 more, fed them, and they are laying tons of eggs. Again, this is with me bugging them almost daily (with light, not moving them). The one that wouldn't eat originally was infertle and I let her go. Most ant keepers (including myself) disagree with this method. Ant queens are designed to survive, and thrive without food during the founding stages. It's how their bodies naturally work. No stress is crucial to proper development. They simply aren't designed to not mind having their homes shaken constantly, the "roof" of their house lifted up, and giant globs of unnecessary food getting shoved into their living quarters. In most cases, development will slow, and chances of eating their eggs goes up. Food at this stage also presents multiple hazards. The most immediate negative effect is getting stuck or even drowning in globs of honey (note that is hard to drown an ant, but removing your queen from a sticky drop of honey is extremely dangerous, not to mention stressful for the queen. Also, feeding in the tube, no matter how big or small the colony, can cause mold outbreaks, causing you to have to move your queen to a new tube (if she wasn't killed by the mold, some molds are worse than others) Moving = more stress. Try to remember, these ants are not like any other pet. Just because human and many animal babies and mothers need food to survive, doesn't mean that it is "better" for the ants to be fed during a time where they don't need food. 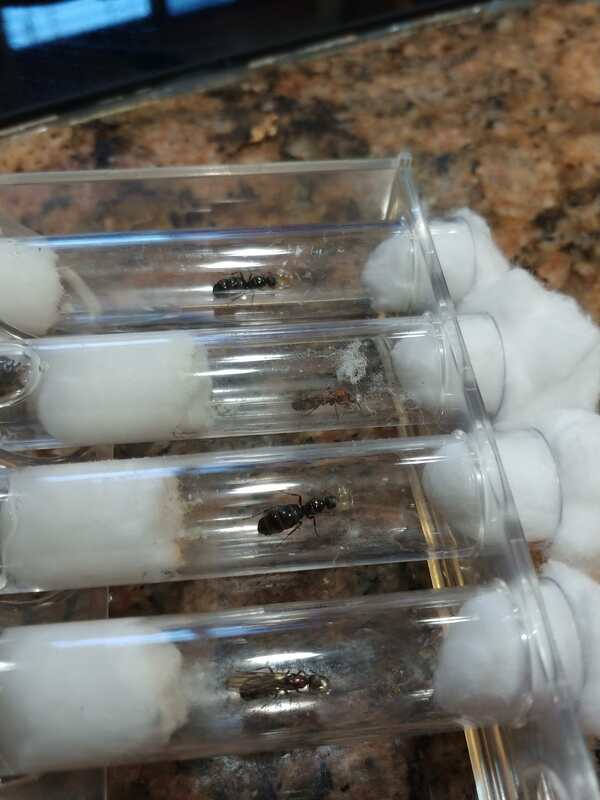 There are times that call for feeding a queen in the tube, mainly if a queen has had significant setbacks such as losing all her workers and left on her own again after becoming dependent on workers. If there are nutritional benefits to feeding your queen, they are quickly outweighed by the reality of stress being a very common killer for our queens. I feed all my queens when I catch them. Both sugar water and insects. Then after a couple days I remove the food and then leave them alone until they have a worker born. I will feed the queens in the tube if I have to. Such as if the queen had larvae and then all the larvae disappeared. Or if she didn’t lay eggs for weeks then I will top her up with a sugar water cotton ball. For instance I started a bunch of parasitic Lasius colonies. It took over a year for them to have workers born. I think it’s safe to say if I didn’t feed them regularly they would have starved. Also it’s pretty obvious to tell if you’re stressing out your queen. Some queen and species get way more stressed and some don’t seem to care about anything. First the test tubes should be covered so it’s dark. If you remove the covering and the queen starts freaking out then you are not helping her by giving her food. Next test is removing the cotton plug, usually this causes panic in the test tube. The third test is actually placing food in there. If your queen is ever put in a position where she is panicking inside the test tube and wants to escape than that is not good. And may seriously delay her egg laying because she doesn’t even want to start a nest in there because she thinks it’s not safe. However if you have one of those queens that isn’t bothered by anything than there is little harm from feeding her except for mold growth that could occur. The only species I can think off that would let you get away with this is Lasius Nigers, only due to the fact these are hardy little folk. However I also did not feed my queen's until their first worker arrives as previously suggested by a number of more experienced keepers including Mikey himself. All has worked out fine. I did not loose a queen until after her workers arrive. I'm lost as to what happened tho as they had little interaction with myself outside of feeding, yet it seemed something went wrong and they all literally gave up. Again tho that was after the workers arrived. Now in terms of my other species. Even tho Myrmica are semi-clautral even normal feeding times can still be way to much on a single queen. For example one lived. The other Myrmica I believe was of a different species died. I put down to stress on my part as everything else seemed fine. That or nature's kill switch came I to play. I have to agree with Idahogirl however. I took her advice from day one and I have not regretted it since (thank you btw for a massive input to my starting days btw Idaho) I honestly get where you are coming from but why mess with nature's design that has worked long before the human race existed? I'm looking back over this thinking that maybe we should compile a list of ants with two categories. One is hardy ants for example Lasius Niger, and the other side is more fragile and easily stressed ants like Myrmictr do not seem to like any form of interactions in comparison to Nigers. This could be useful in the sense that I'd be worried someone will read this and think it's a good idea before confirming if their ant is a fragile species and they kill them due to stress. And if we do manage to get a nice accurate one made maybe the mods can pin it for poeple to find easy? I dono I am just thinking of future ant lives that do not need to be lost due to a basic mistake.